Within you will find photos and explanations of some of my most recent art. Here is an example of one of my designs. This outfit was made for the Masquerade at CONvergence. 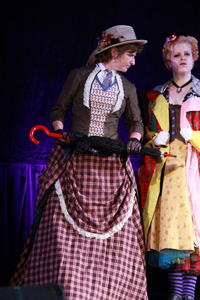 The idea was to make a Victorian Lady version of Doctor #7 from Doctor Who. The rest of the Doctors and I took “Best in Show”. Within this site you will find Christening gowns made from wedding dresses, period costuming for the Renaissance Festival, Halloween costumes, toys and much more. Of course, not all of my work can be posted, but I have chosen a wide variety of projects I have done just to give you an example of my skills. Please enjoy your visit to Rosedragon Stitchery and feel free to call me with all your questions!